Not Running a Hospital: Dear Mayo, Did you approve this ad? Wow, the potential for this either disorganized or deliberately misleading and incomplete list (enzalutamide etc. missing) to misinform patients is stunning. You’re right, Paul, but “watchful waiting” has been upgraded not only in name (i.e., active surveillance) but also in terms of proactive practices, even as urology treatment records on a collective scale continue to show a massive degree of patient overtreatment. Typical of the newly recommended actions include diet (like cooked tomato sauce), exercise of an intensity to promote fitness, drugs tailored to the individual and vitamins like vitamin D3 (which becomes a hormone at the cellular level). Gleason grade six lesions, moreover, seem to display none of the characteristics of other grades of prostate cancer nor is there unequivocal evidence that this grade metastasizes. The “Prescription” and “Also Common Procedures” parts read like laundry lists that hardly anyone is likely to pay close attention to. Robotic surgery leads the way likely because the hospital needs to recoup the cost of a multi-million investment that has shown no efficacy over other forms of prostate surgery. Notice, too, the notable absence of Cures, as if Mayo could have been talking about diabetes treatment (versus diabetes reversal, the non-drug approach that community medical groups have begun to undertake from sea to shining seas. The Google doctor whose name is touted in the press release is an innovator/startup guy with a Twitter account that has never tweeted, though a Merck buddy @JABrilliant congratulated him in November for being seen on Shark Tank. 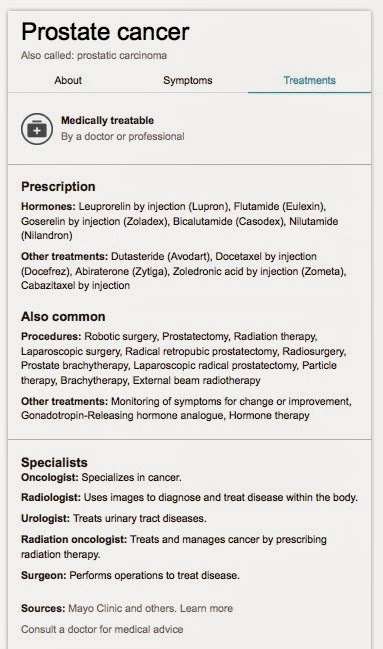 "Immediate treatment may not be necessary"
"For men diagnosed with a very early stage of prostate cancer, treatment may not be necessary right away. Some men may never need treatment. Instead, doctors sometimes recommend active surveillance." So the real question is, who's IGNORING Mayo's actual recommendations and posting something different over Mayo's name? This seems to me to be an excellent example of why all "curation for sale" efforts require absolute transparency. BIG problem here. Surprising that it got past Google's risk management lawyers. If things are as fishy as suspected, there may be a cease & desist in the works at Mayo. Mayo's risk management attorneys are probably all over this. I see the value of Google doing the quick answers for simple topics but not for medical stuff. Seems like they are better continuing what they've been doing and finding the best 3rd party sites as they've been focused on medical for as long as Google has been in existence. This is a good point as consumers are really getting garbage today out there on the web, and not to say this is garbage here but it seems like who pays calls the shots. I have been watching the amount of either flawed or "out of context" data really grow the last couple of years and yes something needs to be done here and 3 years ago I started the "license" campaign so we know who they are.